Winner of numerous awards including the Avery O. Craven Award and the Bancroft Prize, Ari Kelman is the McCabe Greer Professor of History at Pennsylvania State University and the author of three books: A River and Its City: The Nature of Landscape in New Orleans (2003); A Misplaced Massacre: Struggling Over the Memory of Sand Creek (2013); and most recently, Battle Lines: A Graphic History of the Civil War (2015) with Jonathan Fetter-Vorm. Professor Kelman recently took the time to discuss his new book along with the benefits and challenges of a visual medium with Erstwhile’s Beau Driver. 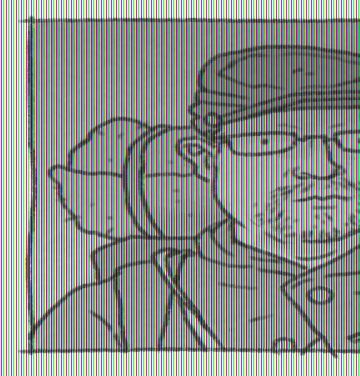 Erstwhile Blog: Ari, Battle Lines: A Graphic History of the Civil War is your third book. What inspired you to work on a graphic history? Ari Kelman: Five years ago, in the run-up to the Civil War sesquicentennial, an editor at a university press asked me to write a VERY brief—not more than 35,000 words—survey of the war for a popular audience. I was convinced that I couldn’t do justice to the sweep of the conflict in such a short book, so I passed. Then, because I’m completely neurotic, I started second-guessing myself. I spent a lot of time pondering how few words I’d need to write the war’s history. Eventually, I decided that the solution was to write a graphic history. I pitched the idea to an editor at Hill and Wang, which has a graphic books series. The editor thought it was a good idea. And so Battle Lines was born. The only problem was that I had no idea how to write a graphic book. EB: What challenges did working on a collaborative, graphic history present, when compared to your other books? AK: The challenges fell into two categories: logistical and creative. Logistically, it was complicated to coordinate our workflow across time zones. Jonathan lives in Brooklyn (because as everybody knows, all artists must live in Brooklyn). And I lived in California. So we had marathon phone conversations deep into the night, which meant that both of us became nocturnal for a few years. As for the creative side of the ledger, it was odd to work with someone who didn’t share my disciplinary toolkit. Jonathan, for very good reason, wanted the freedom to create characters and set dramatic scenes throughout the book. And I always felt constrained by a historian’s responsibility not to do violence to the past. Eventually, we reached a compromise: we would never put fictional dialogue in the mouth of a non-fiction character, and every scene in the book would be informed by historical documents. Having said all of that, the creative synergy—though alas, not across platforms—was far more rewarding than the challenges were frustrating. I learned to look at history that I’ve studied for many years in an entirely new way. And Jonathan became one of my close friends. It was such a good experience that we’re almost certainly going to do another book together. EB: In Battle Lines, you and Jonathan Fetter-Vorm have presented the Civil War through a series of vignettes. How did you two decide on what stories, or “portraits” as you call them, would make it into the book? AK: To a very great extent, the choice of vignettes was like the triage that professors have to do when they construct a syllabus and write lectures for a class. We’re always struggling to balance depth and breadth, coverage and color. In this case, I wanted to focus on episodes that were canonical, but then put a different spin on them. At the same time, the book is built around objects—each chapter focuses on a particular object as the fulcrum for the narrative—and so I considered that as well. Then, after we roughed out the book, I freaked out a bit, and we added text at the front of each chapter to orient readers in time and space. We mocked this material up to look like period newspapers. Read together, these contextual pages amount to a very short survey of the war. EB: I think you two did a great job of balancing between vignettes that many will recognize and some that are lesser known. Your treatment of the New York Draft Riots is one of the more striking of these. Did you find that the graphic medium allowed for a more emotional recounting of events? Additionally, did you find that working visually had other benefits to recounting these events? AK: I do think the graphic medium allowed us to convey more drama and build more tension than a traditional prose book would have. Visual images obviously have an immense amount of emotional heft. Having said that, that impact or weight could sometimes be something of a double-edged sword. Neither Jonathan nor I wanted the book to become overwrought, and so we constantly had to check ourselves when chapters threatened to shade into the maudlin or mawkish. As for the benefits of working in this medium, for me the greatest was learning an immense amount about the construction of narrative and the limits of prose. I had just written a book that is, more than anything else, an exploration of the power of stories, particularly the challenge of reconciling incommensurable narratives, as well as the boundaries and limits of knowledge, of competing epistemologies in other words. Given that work, I thought I had a pretty decent handle on storytelling. Not so much, it turned out, as writing a graphic book taught me how fettered historians are as writers. We’re bound by the limits of text—and also, of course, by the limits of our methods. To be clear, I don’t think that’s a bad thing at all. Those limitations are part of what defines our discipline and keeps us honest as stewards of the past. Still, it was fascinating to find myself able to convey a point using the shorthand of visual metaphors. For example, there’s a two-page sequence in the book in which Frederick Douglass delivers a speech, raging that the United States needs to be remade by an earthquake. We juxtapose that speech with an image of contraband slaves—enslaved peoples who crossed Union lines or were captured by federal soldiers—digging trenches, moving earth, and experiencing something very like slavery by another name. Turning to the chapter on the draft riots, that is some of Jonathan’s best work. Offering readers a braided narrative, three very different stories unfolding simultaneously and then meeting in a single, tragic moment, was incredibly complicated, and I think Jonathan pulled it off. It’s also another example of the way my book about the Sand Creek massacre informed our work in Battle Lines. Much of the hard work in A Misplaced Massacre pivoted on the juxtaposition of disparate stories, and that’s very much what we tried to do in the Draft Riots chapter of this book. EB: Your previous two books largely centered on a physical place or a location, the Mississippi River / New Orleans and the site of the Sand Creek Massacre, respectively. With a topic as diffuse and spread out as the Civil War, did you find it difficult to find a similar point from which to build your work? AK: Having spent most of my career focused on issues of space and particularly places, it was actually a bit of a relief to spread out geographically in this book. That said, both Jonathan and I remained very focused on landscapes, which we thought were an important part of telling the story of the Civil War. EB: As I was reading the book, I was thinking about reading it with my children, who are 8 and 14. When you were working on the book, did you have a particular audience in mind? AK: All are welcome! Every single one of your readers should buy at least two copies! They make great stocking stuffers! Beat the Christmas rush! Kidding aside, we had a very broad audience in mind, readers ranging from smart middle schoolers or high schoolers, to students taking a U.S. history survey at the college level, to adult readers interested in graphic books or the Civil War. A number of people have asked me if I’ve let my kids, who are eight and twelve, read the book. I have, but I think it’s probably too dark and too violent for many eight-year-old readers. EB: In a perfect world, how would you like to see this graphic novel incorporated in a classroom, and is that the place that you envisioned it while you were working on the book? AK: A number of people have told me that they’re going to use it as the last book in the first half of the U.S. history survey, which seems like an interesting idea. And I know a bunch of people who are planning to assign it in courses on the Civil War. In a perfect world, I’d also love to see it assigned in graduate seminars on methods, historiography, and, most obviously, historical narrative. EB: You mentioned that you and Jonathan Fetter-Vorm have talked about another graphic book—and Fetter-Vorm has also authored Trinity: A Graphic History of First the Atomic Bomb, which is great as well—what do you see in the future for graphic treatments of history? AK: I think it’s a pretty wide-open genre, actually. To be clear, there will be more and more graphic histories coming out in the next few years, I’m told, but I don’t think the marketplace is in any danger of becoming saturated. Jonathan and I, for instance, are talking about doing a graphic treatment of the book I went to graduate school to write (and then, because my advisor died, couldn’t finish): a history of the Cherokees between the Trail of Tears and Reconstruction. Having said that, the barriers to entry are pretty high. Finding someone with Jonathan’s talent, both as an artist and a narrator, is unusual. And there isn’t as much money in writing graphic books as people seem to think. Which is to say, it has to be a labor of love, which most of our work is anyway, right?